Andalusite is best known for its strong pleochroism and its unusual color which is frequently a mixture of both red and green. It is not a color changing gem. It often shows two colors, (red and green) at the same time. Rough crystals will often show green in one direction and red in another. The color is difficult to match on any standard color chart. 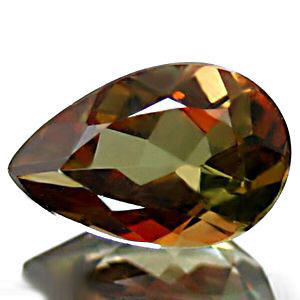 Occurrence: Brazil, Sri Lanka, Spain, East Africa, Burma, U.S.A.
Andalusite is an attractive and unusual gemstone, first discovered in Andalusia, Southern Spain, after which it is named. 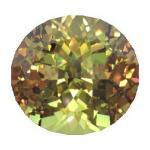 It has some similarities with the more expensive alexandrite, as both are strongly pleochroic. It is suitable for use in jewellery as it is quite hard. The fact that it is seldom seen in jewelry is probably because it is quite rare, and most people, even in the jewellery industry, have never heard of it, let alone seen it. Andalusite is a gem that is capable of displaying different colors at the same time. 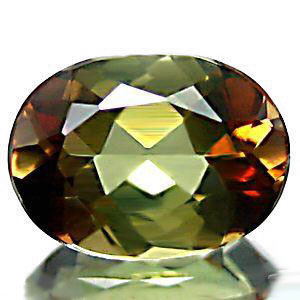 This is different from the color changing gems like Alexandrite and the color changing garnets, because the different colors on Andalusite are displayed at the same time. This is called pleochroism, which is caused by the double refraction of light in a stone. When the two rays of light pass through the stone, they travel at both different angles & speeds, and display different colors of the spectrum. This allows a person to see different colors on the stone, when viewed from different angles, in the same light source. For the color changing stones like Alexandrite and color change garnets, it is necessary to have two different light sources to be able to see the color change. 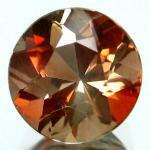 Typical colors for andalusite are green, brown, red, greenish-brown, brownish-green. Its pleochroic colors are red, green and yellow. Because of the pleochroism, the color of an andalusite can be affected considerably by the direction in which it is cut. Our photograph is disappointing and deceptive. The actual stone is a pleasant greenish brown to red. We used flash lighting with a digital camera, followed by software adjustment of the lighting levels, and the effect was to make the stone appear quite a dull brownish color. An impure variety of andalusite known as chiastolite contains carbonaceous inclusions in a cruciform arrangement. These are cut as cabochons and polished for use as amulets in many countries, largely because of the symbolism of the cross. Although as we have already noted, andalusite was originally discovered in Andalusia, Spain, it is also found in Brazil, Sri Lanka (Ceylon), Siberia, Canada, Australia and the USA. Small non-gem crystals are also found in Cumbria, UK.